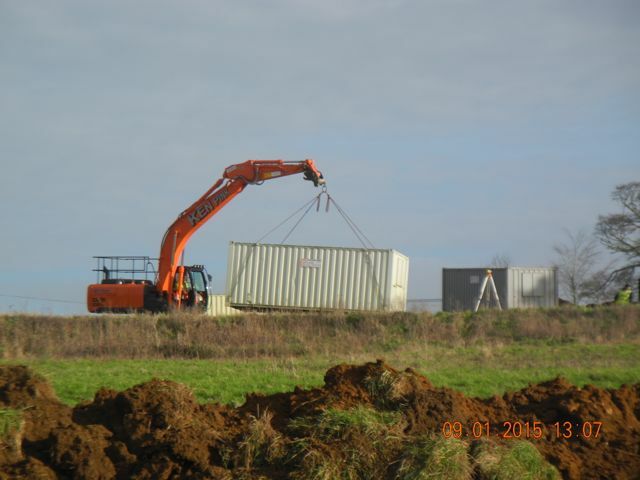 The new year started with a bang, after a site meeting with client, contractors (Cranatt Construction) and architect (Yiangou Architects) at the start of the month the heavy weight machinery moved in and earth-moving at Enstone began on a large scale. 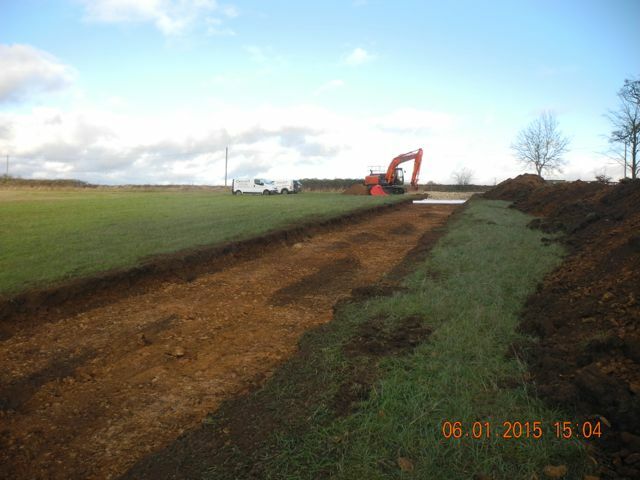 The first order of business was to prepare the access road coming in from the lane to the east. This cut a broad swathe across that top field through topsoil, subsoil and onto the brash and revealed... nothing! We also examined the resultant spoil with similar blank results. 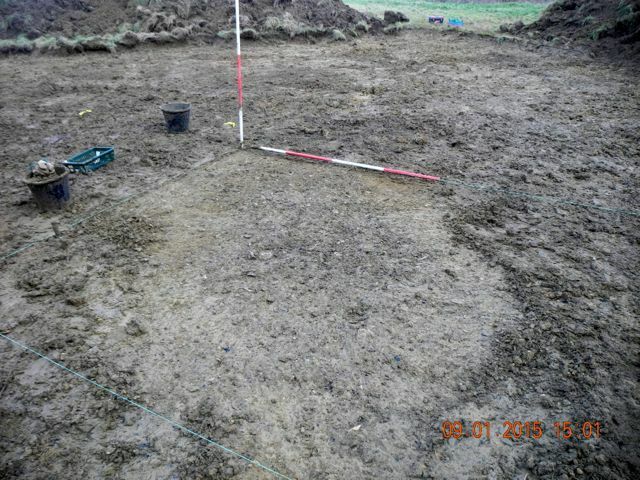 This chimes in with the other field walking and detecting work we have done here and poses us a big challenge in terms of why this field is so ridiculously free of archaeological material. 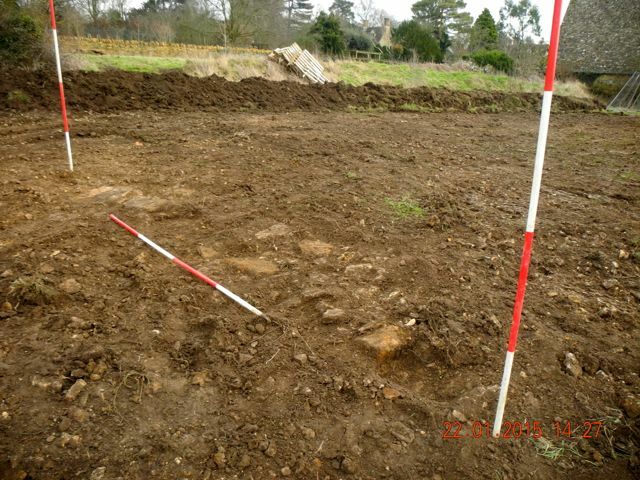 As part of the preparations for future land-scraping the turf and topsoil were scraped off a large area towards the western edge of the site immediately next to the north west corner of the formal garden. 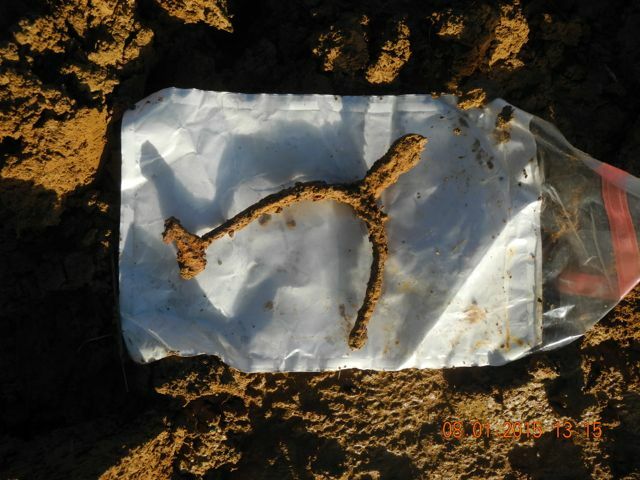 Peter checked the area and spoil heaps for residual metalwork and discovered a spur, possibly 17th. century, whilst I zoomed in on assorted spreads of animal bone, pottery, glass and charcoal adjacent to the gardens. After further cleaning this began to resolve into two distinct oval patches which we interpreted as the fill of two pits. 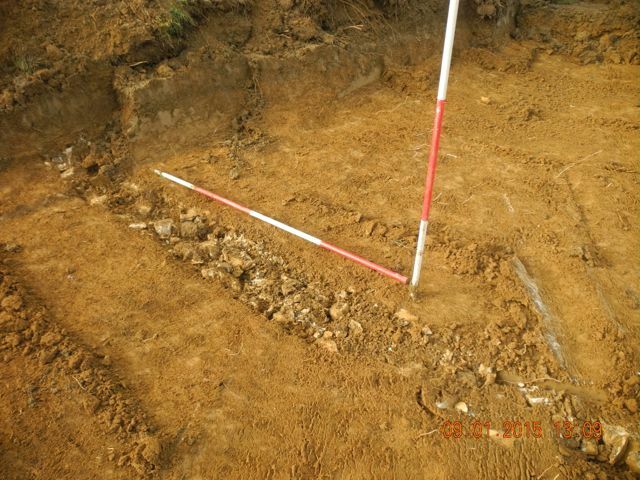 Of course there are always several explanations for the presence of pits so the plan would be to fully define their limits then excavate them, probably by half sectioning. Further to the north the ground becomes less and less interesting from an archaeological point of view although Ian, the digger operator did clean off very nicely across the top of a field drain, no ceramic pipe but plenty of rubble filling a narrow trench so it could be early. Meanwhile the contractors started to bring in all the comforts of home as a series of tool stores and site huts were swung into position. We also took the opportunity of having a spare moment with the big digger to take a sneak preview of any potential features associated with the terrace that runs immediately behind the site of the new house. At the point examined the retaining wall which is evident in other places had been almost completely robbed out and the whole trench was, once again, pretty sterile from an archaeological perspective. Hanwell has by no means been forgotten although we are avoiding large areas of garden now that the snowdrops are on the verge of blooming. 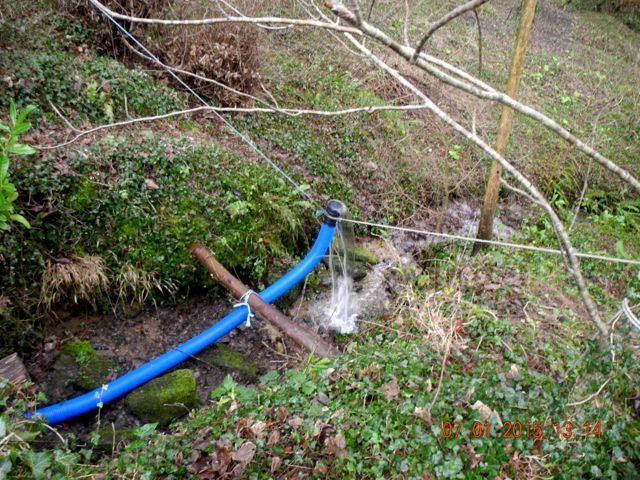 However, in order to facilitate the clearance of a fallen tree from the lake Christopher has taken on the task of at least partially emptying the lake with a splendidly inventive siphon mechanism. This potentially creates opportunities to examine some of the possible features on the lake bottom particularly around the island and indeed round the perimeter of the lake itself. The main question is, of course, without water to float our boat how do we get around? 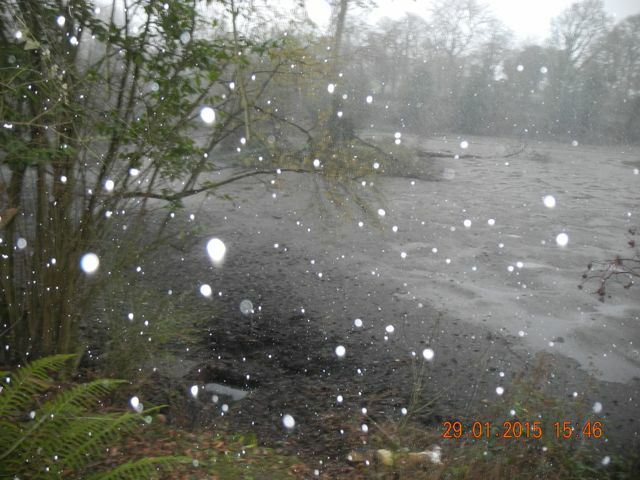 The downstream end of the siphon pipe emptying the lake. The way to the island... just mud! As the lake emptied we discussed the best way to make use of the fact for our investigations. 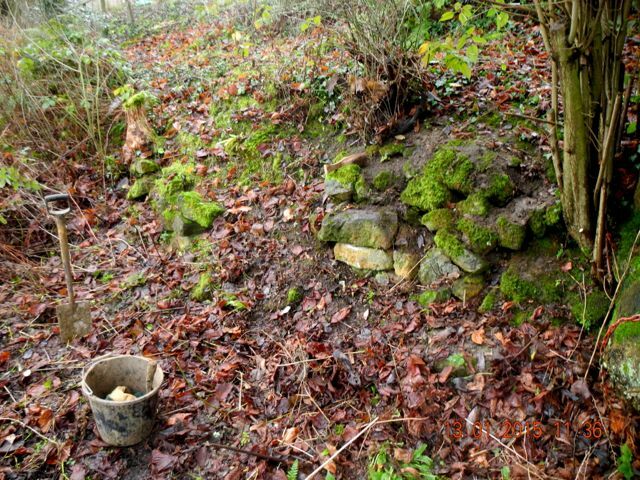 We decided to begin by taking another look at the surviving walling already identified along the south side of the lake. We could take the opportunity to expose more of this walling and better still cut a section in front of it through the lake silts and hopefully identify the bottom of the lake and examine its construction. 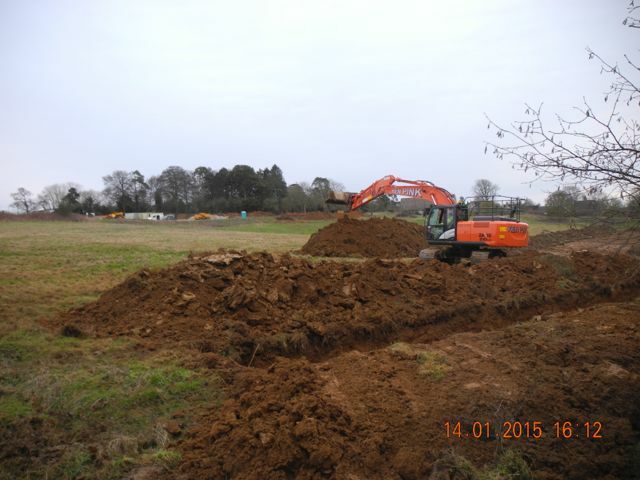 So a start was made but not a huge amount of progress seen on account of the demands of being on site at Enstone. At Enstone the moment arrived when it was time to cut a long trench from just behind the Crown Inn, along the driveway, round past the bungalow and the west end of the barn and out into the countryside... 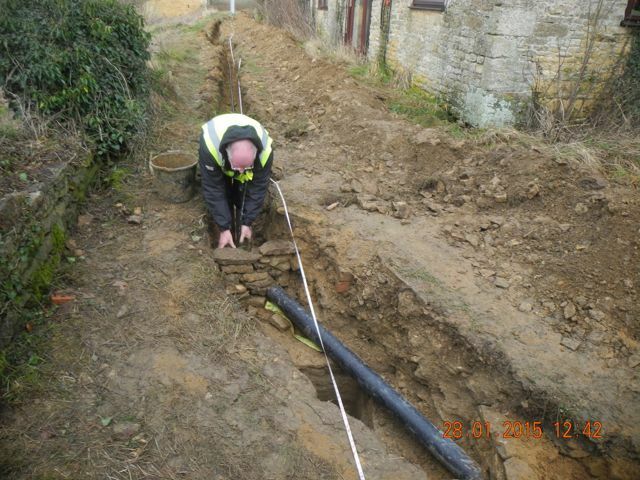 The trench was 450mm wide by 600 mm deep although the width was doubled for the first section to accommodate an additional phone line. The way it works is that you spend a lot of time eyes glued to the bucket of the digger seeing what's coming up and actually listening too - there's a distinctive graunching sound when digger meets wall or foundations. Actually its quite difficult to distinguish between the natural brash, a collapsed dry stone wall and the walling itself. I don't think we cut through anything but we'll check the sections to make sure. 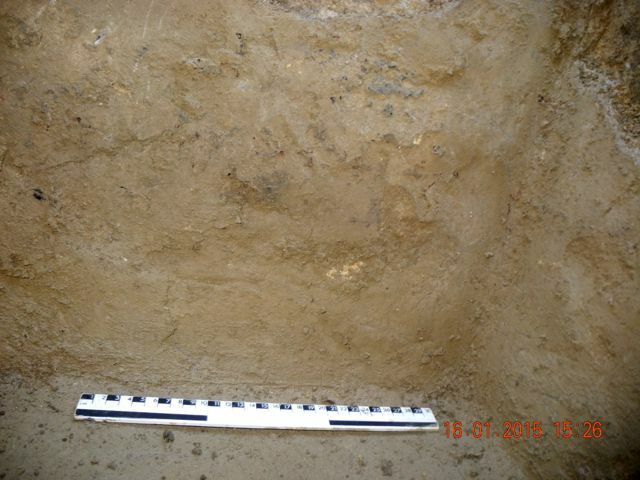 Of course significant changes in soil colour and texture are also important markers as are the odd bits of pottery, bone and glass that are thrown up. 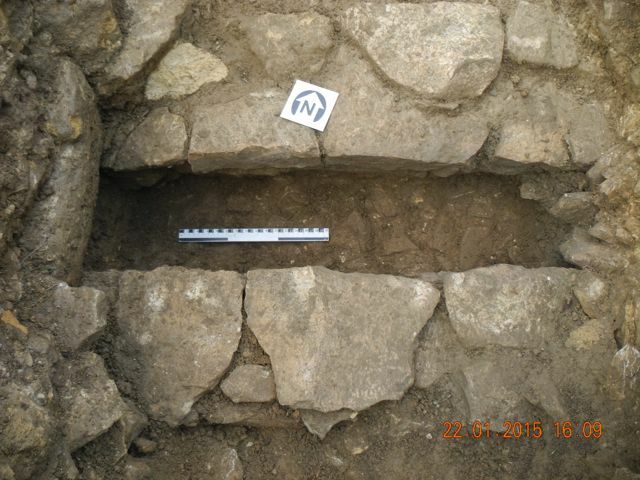 What's interesting and again slightly alarming is that we came across no medieval or earlier material, everything in the way of small finds was post-medieval. Once something interesting did come up the routine was to halt the digger and jump into the trench, trowel in hand to see what it was. We were then able to instruct the digger driver to cut less deeply so we could then return to dig that portion of the trench by hand. 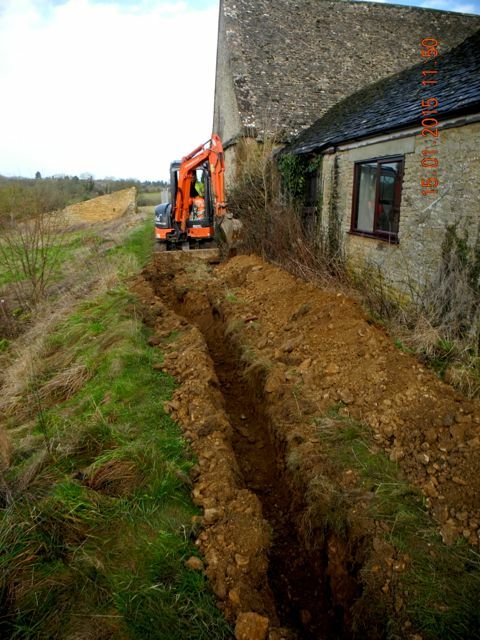 The double width trench just behind Rectory Cottage and the really ticklish section coming past the end of the barn. 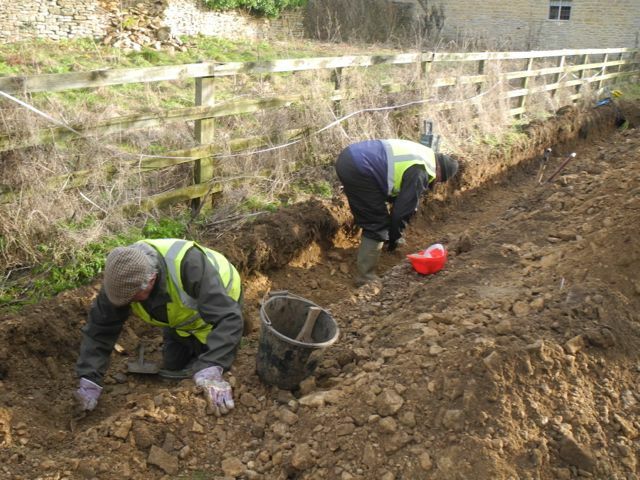 Peter and Mike checking for traces of a potential wall where some anomalous ironstone blocks had been spotted. 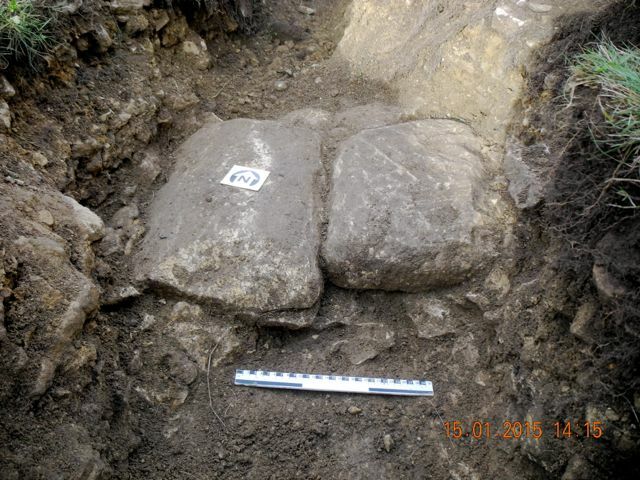 The main features which were spotted included two large stones, one of them shaped cushion fashion so possibly a reused coping stone, which were assumed to be capping for a drain, although their position close to the north west corner of the barn, seemed odd. 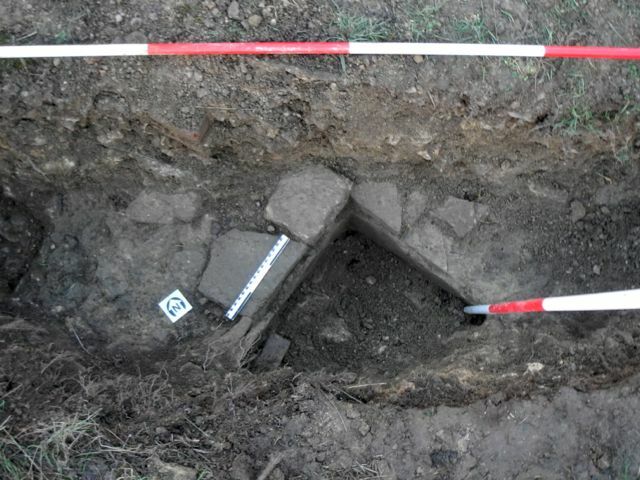 However, the most significant find, without a doubt, was a small group of stones which seemed to define a right angled corner. 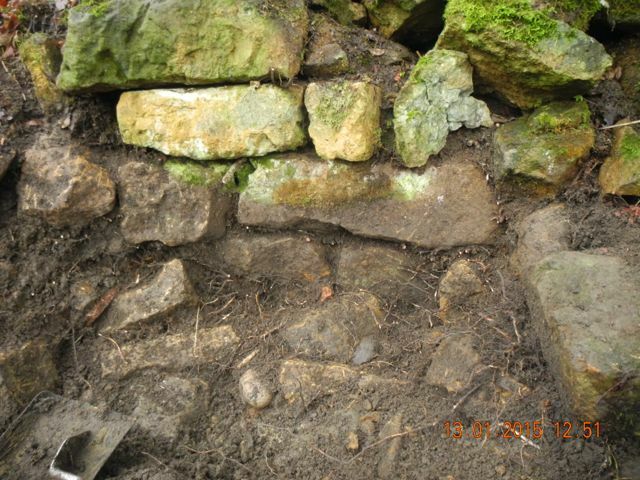 Further cleaning revealed two quite large mortared walls and the space within the angle was rendered with a cement like mortar. At first we didn't know what to make of this and some of the contractors who peered into the trench were a little dismissive suggesting that it was a modern feature, probably a manhole of some kind. I was not so sure, the rendering certainly resembled modern cement but having taken advice it appeared that there were other earlier formulations that look much the same. Capping for a drain? First sight of our walling, view looking north. Speculation was rife and at one point I wondered if we had hit a corner of the earlier house and were about to plunge down into a cellar. 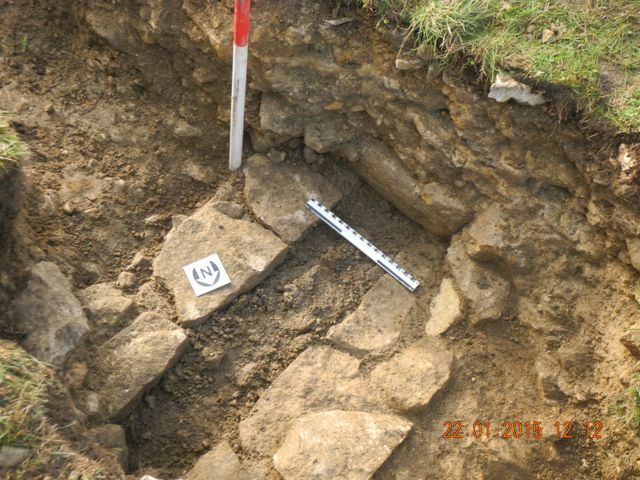 Further excavation of the fill did much to make the situation clearer. 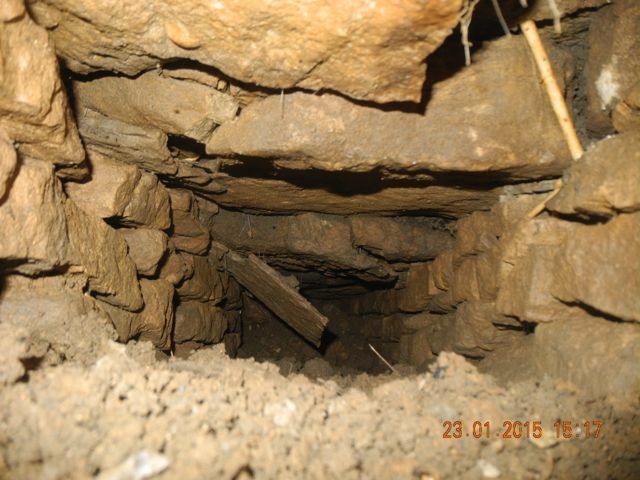 First of all once the feature was bottomed out it became obvious that it was fully lined with render and was therefore a cistern or water tank of some kind. 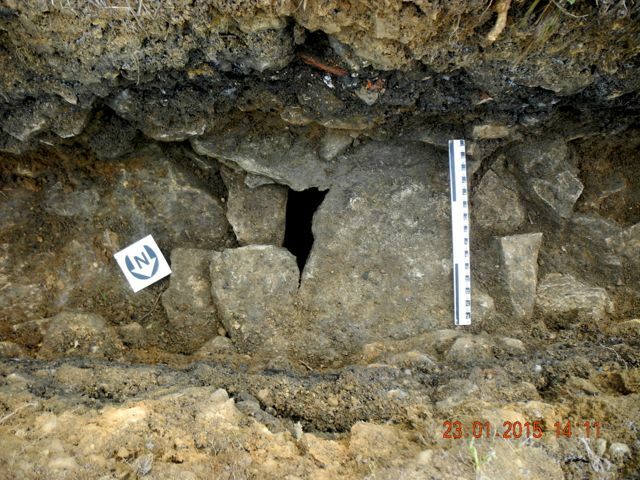 Although there was no direct dating evidence the fill consisted of the shattered remains of a large building including dressed stone blocks, stone roof tiles, lumps of mortar and perhaps most significantly large fragments of decorative plaster mouldings. This material must have come from the great house which we know was demolished post-Civil War so the whole thing seems firmly set in the seventeenth century. 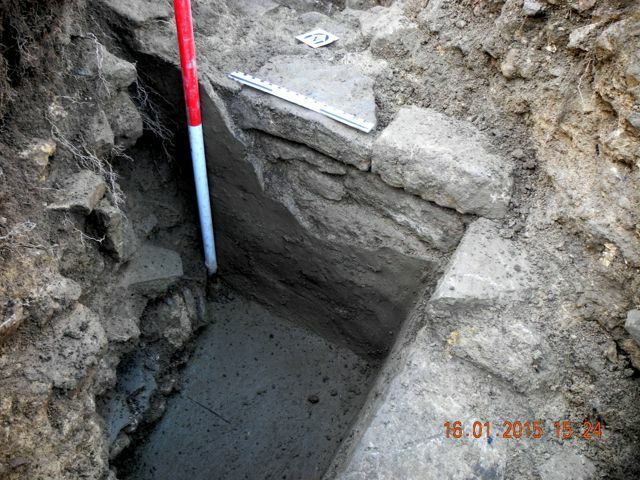 Also interesting was the fact that there was no build up of organic material or silting in the base of the cistern suggesting that it was functional right up to the moment when the demolition was carried out and the debris dumped in to it. Excavation underway on the cistern. 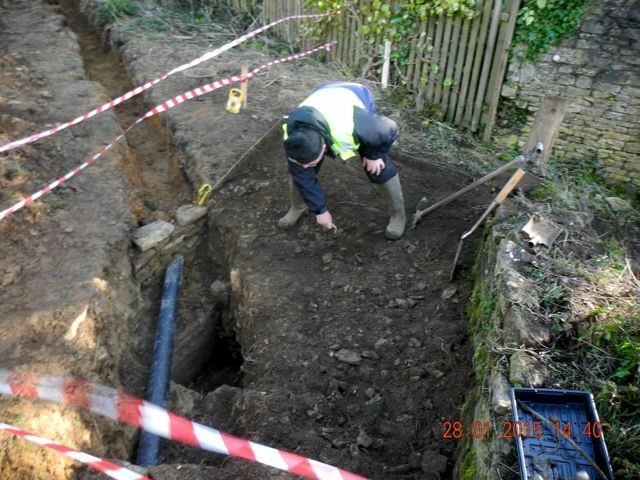 The cistern emptied - at least that portion exposed in the services trench. 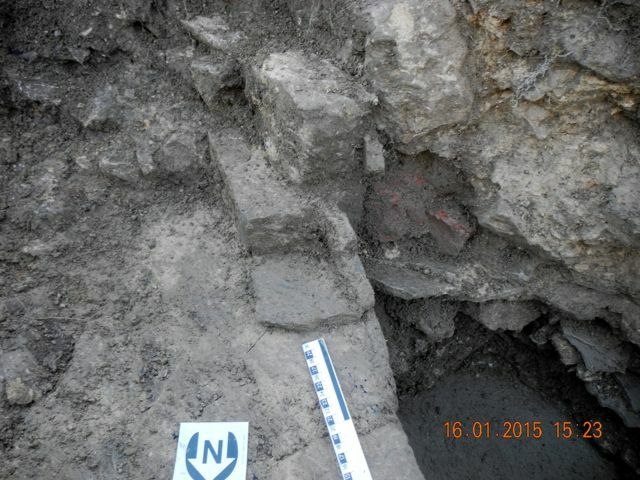 Material from the fill, all evidence of the demolition of a grand house. Curious stone and brick work, could there be more to this structure than a simple water tank? Detail of the finish of the cistern's lining. 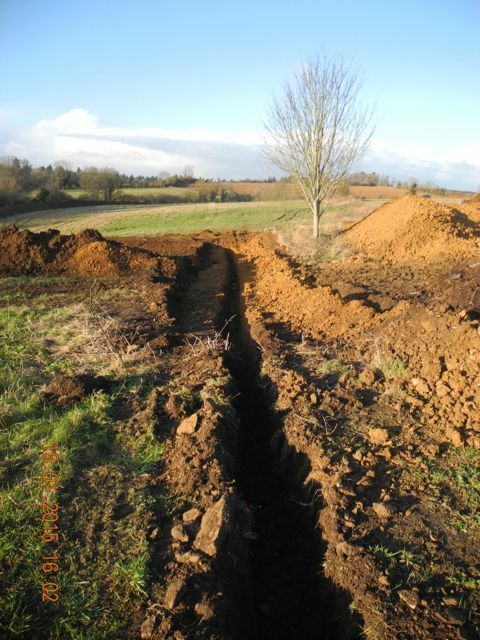 The services trench disappears off into the field with no finds at all. 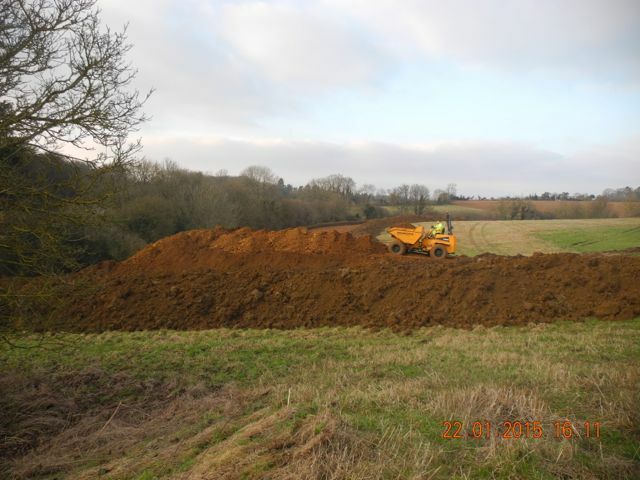 Meanwhile huge quantities of turf and topsoil continued to be stripped in the field to the north in preparation for taking the spoil from the site of the new house. 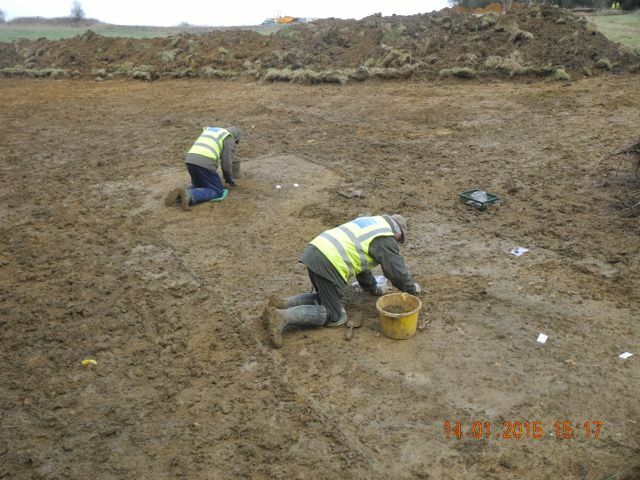 Our pits turned into patches and so we removed them recovering glass, pottery and bone, again all of it apparently of the seventeenth century - nothing older.... nothing newer. Odd. Mike and Robin finish examining our concentrations of finds plus charcoal. The big digger is now approaching the end of the field. 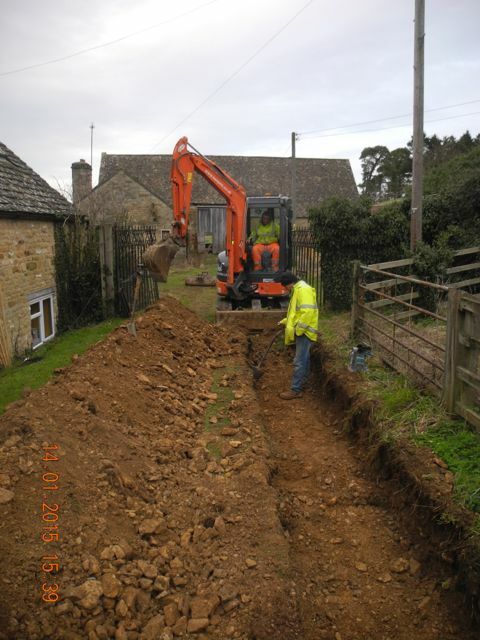 On Tuesday of week 3 we were in a position to lift the capping stones above the drain to the north west of the barn - they had to come out in order to drop the levels low enough for the cable. 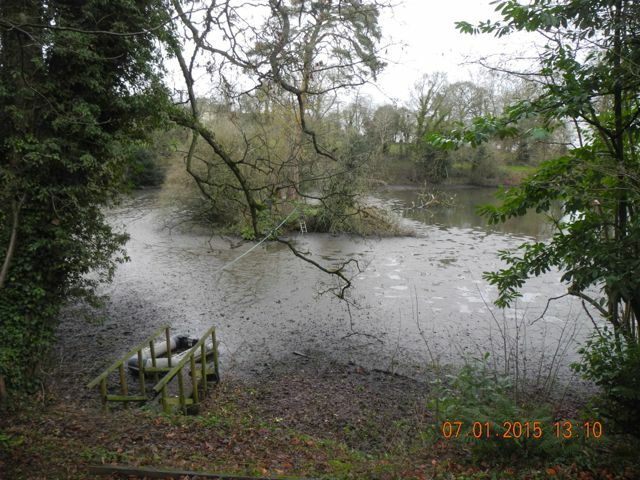 There was a shallow void below the capping but the drain was largely silted up. 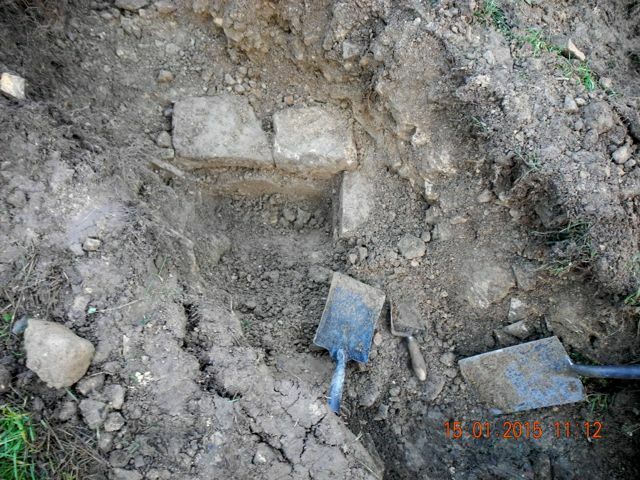 We took samples then excavated down to a rubbly base - no finds unfortunately so no dating at present. 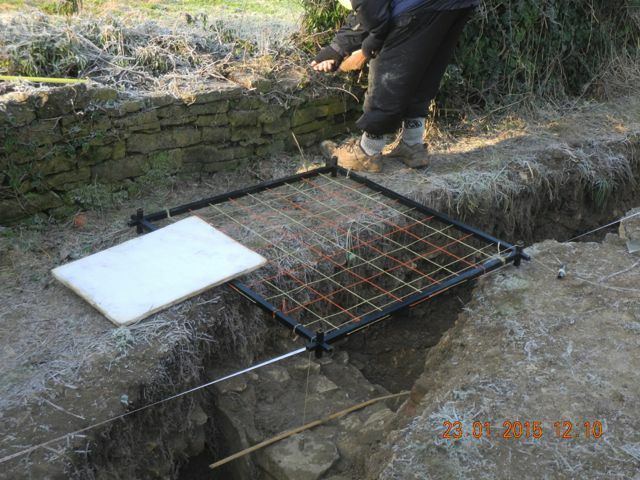 We have speculated that given its position relative to the barn that it could be part of a system designed to drain run off water from the huge roof of the barn in which case it may well be medieval. 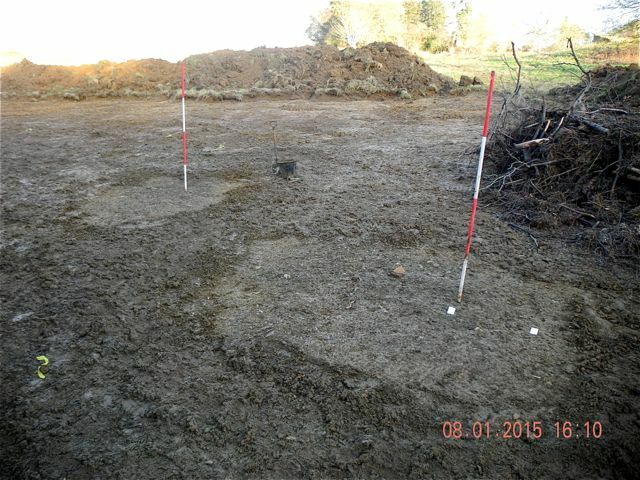 The contractors had also stripped a shallow depth of turf from the area to the north of the barn which is to be stoned and used for materials storage. 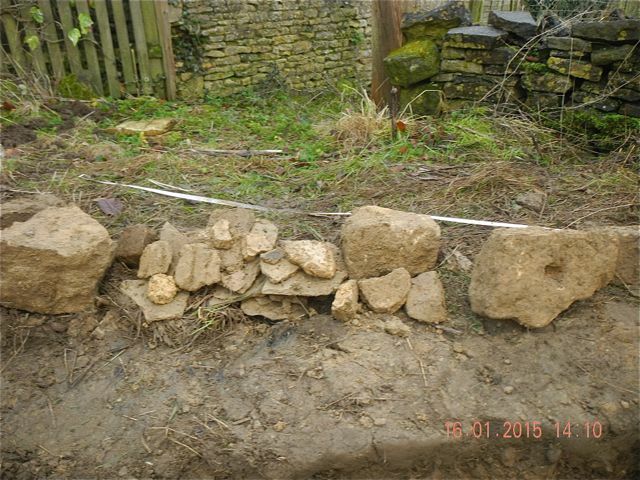 About 20 metres out from the barn we came across the footings for a wall, probably that shown on the 1881 O.S. map. 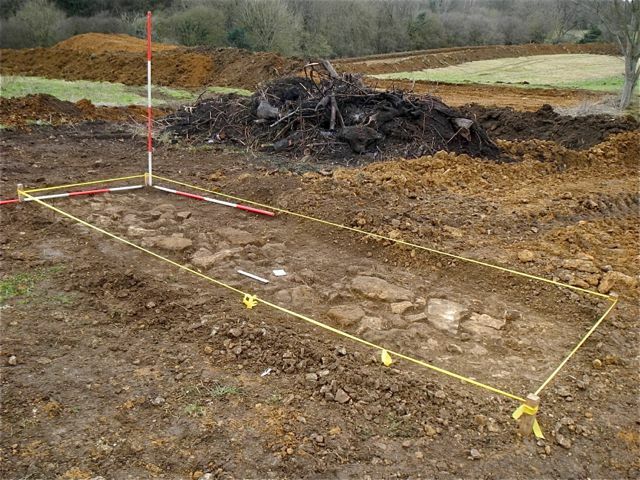 Perhaps significantly it contained some large blocks of ironstone, a feature we are beginning to identify with the medieval phases of the site. At the same time a huge chunk of valley side was removed in order to create the terracing on which the new house is set. 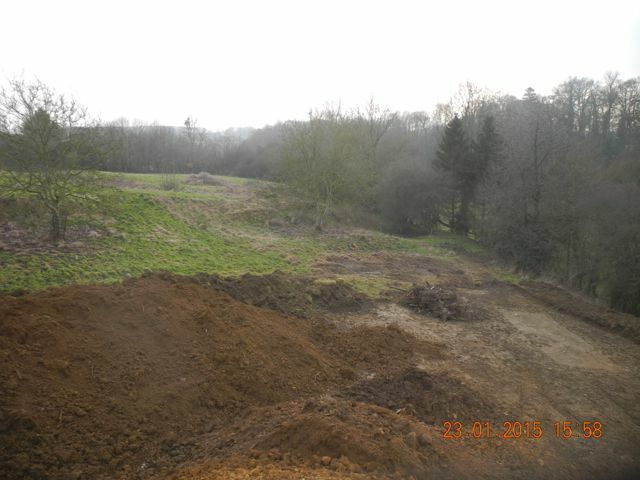 This in effect created a new hill to the north of the formal garden getting on for 8 metres in height. The channel as first uncovered and its relationship with the barn. The channel as cleared and the construction of the retaining wall to the south. 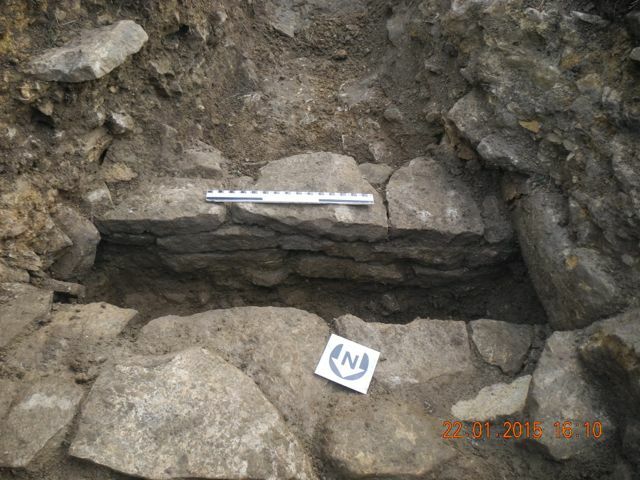 First look at wall footings north of the barn, view looking south east. A new vantage point perhaps? Of course any one out on site in January is asking for grief and the 23rd. 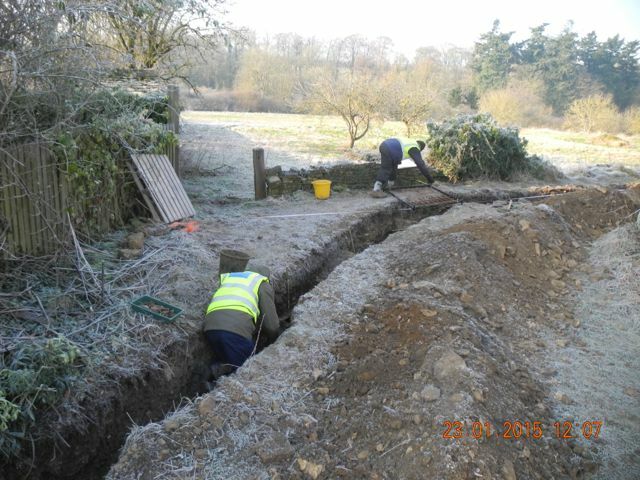 was a particularly challenging day with temperatures at the start of the day down at minus 7 degrees C. Unfortunately that portion of the trench south of the bungalow was permanently in the shadow of Rectory Cottage and so never rose above freezing. Enormous respect to Peter and Robin for persevering in such chilly conditions. There was plenty of recording to do and Peter began to plan the cistern whilst Robin cleaned up in preparation for photography. Earlier in the week Peter had discovered a second drain and this also had to be planned. Once again in order to accommodate the power cable the upper portions of stonework had to be removed and this enabled us to examine what turned out to be quite a well constructed feature. Compared to our first drain this one is significantly wider with thinner capstones of the local lias and little silting above a stone paved bottom. It seems to be running at a diagonal roughly aligned north east to south west and must emerge somewhere in the garden of Rectory Cottage. Again no dating as yet for this feature but it is sealed below a massive build up of charcoal. 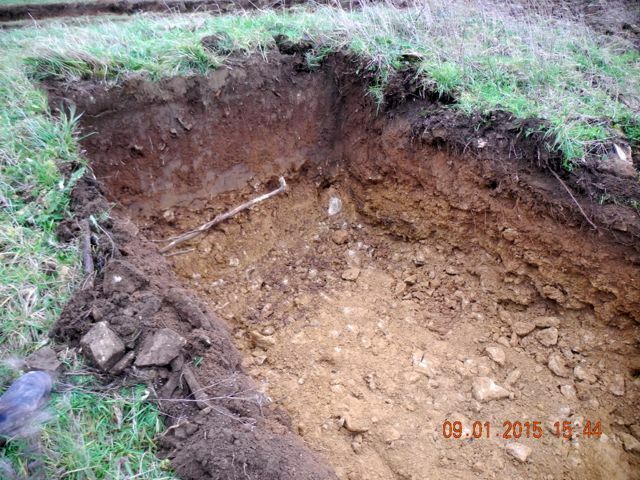 Something else we will need to examine when we extend the excavated area to the south west. You feel cold just looking at the photos, Peter and Robin in the trenches and a detail of the planning process underway, frame in position. 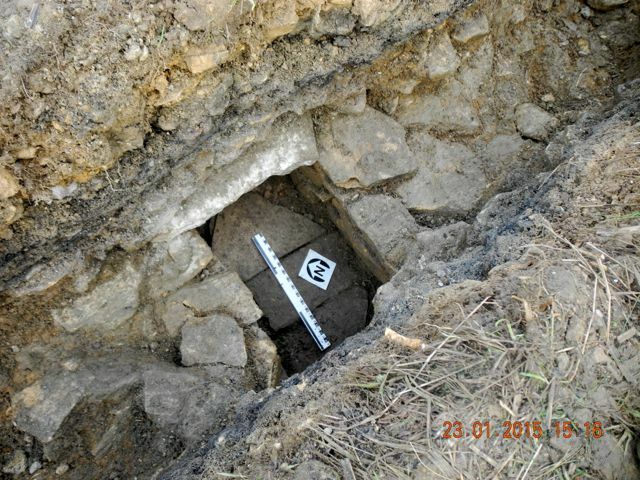 Drain number two or F009 to be precise: with capstone in place and after its removal and the excavation of the silting. Getting up close. the north west retaining wall seems less well built than its opposite number and here is a view looking down the drain to the south west. View looking south from the mountain of earth that has been piled up across to the formal gardens and down onto Area E.
Robin practically single-handedly cleaned up and investigated the wall footings found north of the barn. A little more careful measuring revealed that this feature did not line up with the boundary shown on the OS maps, indeed given the presence of large blocks of ironstone, its overall thickness and the fact it seemed to be the remnant of something larger I wondered if it had been a boundary wall associated with the monastic complex and then largely cleared away by later landscaping. 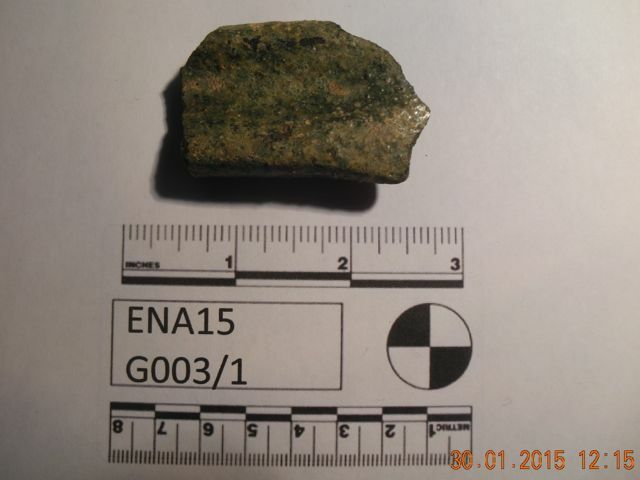 Then pressed well down amongst the stonework was a nice piece of what looks like a strap handle from a piece of 'Tudor Green' ware - an early example associated with construction or a late example connected with demolition? Well further study is clearly required. 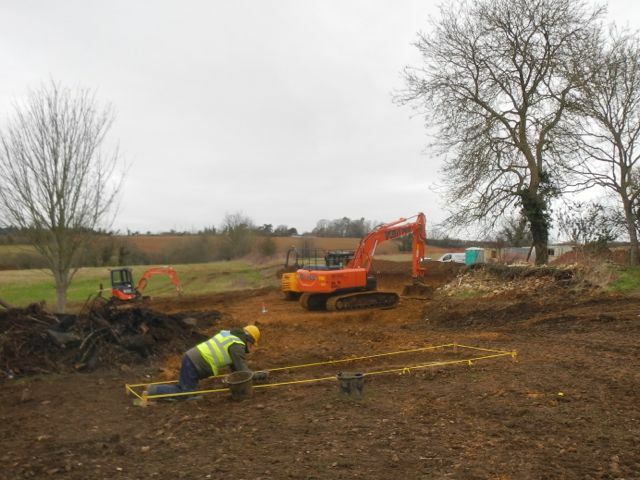 As this area was not scheduled for further earth-moving we closed it down to concentrate on finishing recording all the notable features in the long services trench. 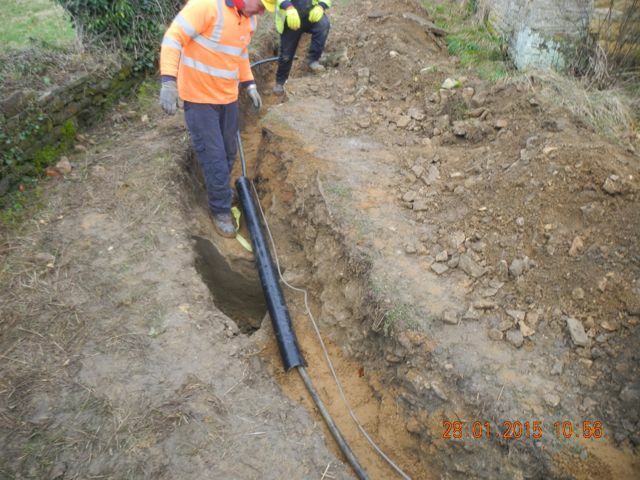 Once this was complete we gave the go ahead to sand the bottom of the trench and then the power cable was laid down. 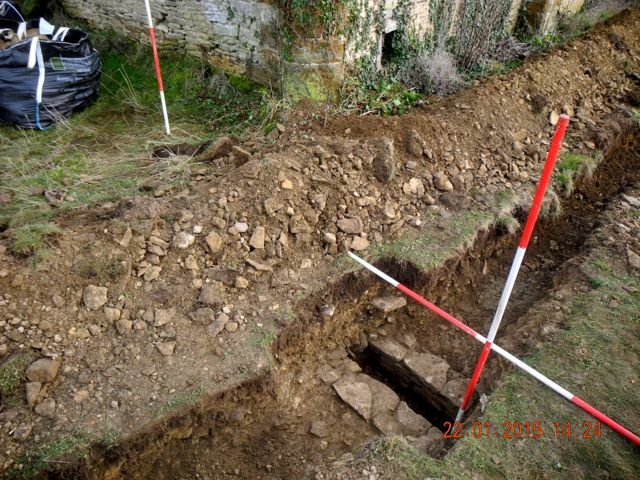 We had to work to preserve access to the corner of the cistern prior to marking out and clearing an area to the south to permit its further investigation. Robin works on as the diggers do their work. 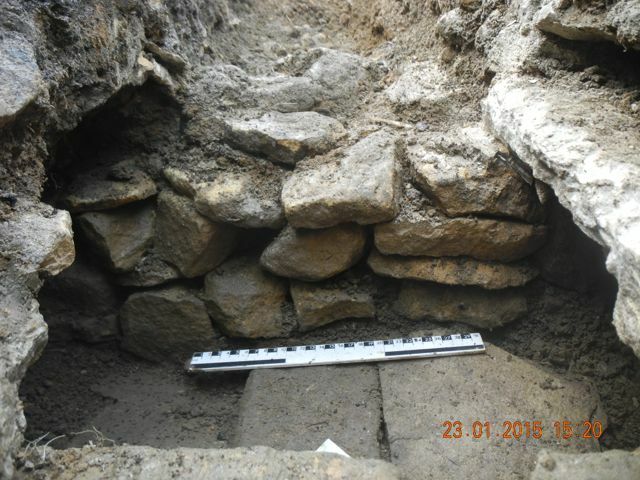 The wall footings after their final cleaning, view looking north west - ready to record. The crucial bit of pottery, a jug handle. The electrical engineers check our bridging arrangements and Peter builds a dry stone wall to hold back the back-filling. 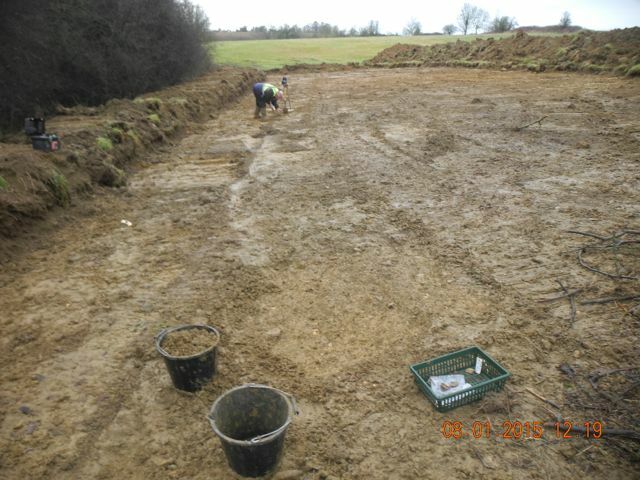 ... and we start to clear the new area above the cistern, view looking south. 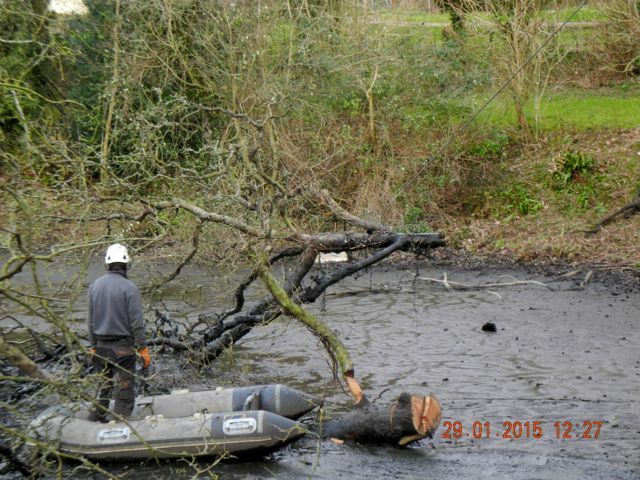 Another brief excursion to Hanwell coincided with the removal of the fallen tree from the lake. The contractors sliced it up, occasionally making use of the inflatable, and then winched out assorted trunks and branches. 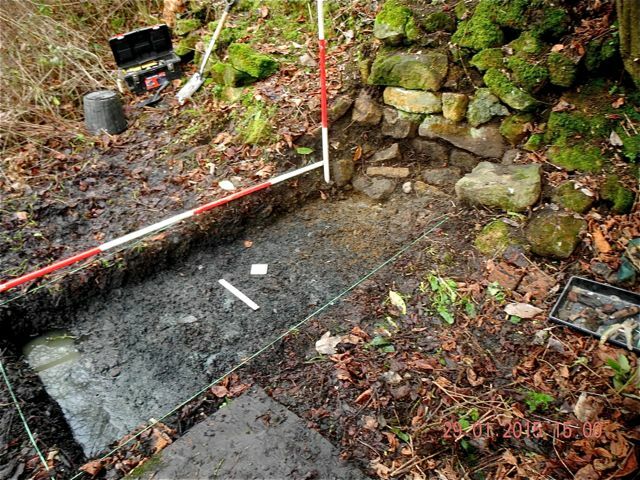 The lake had been partially drained to facilitate this operation and so I needed to get on with the investigation of the lakeside wall and 'foreshore'. This was going quite well, lots of black silty mud shoveled away and an interesting scatter of pottery revealed when a blizzard hit, that was enough excitement for one day. 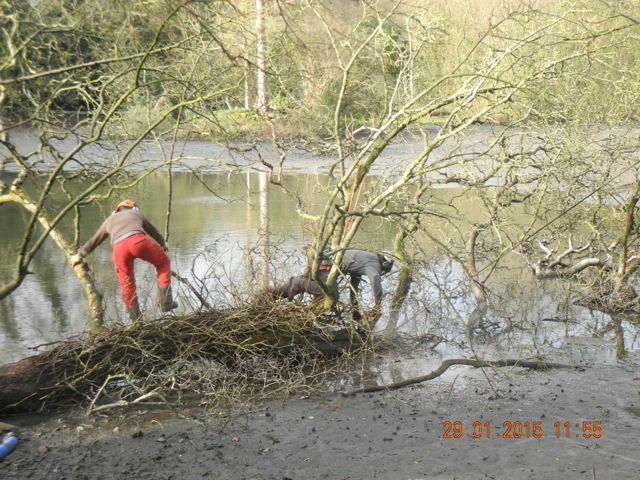 How to remove a fallen tree from a muddy lake - parts I and II. The lakeside trench - already starting to fill with water but with pieces of pottery scattered over the 'foreshore', then it started to snow.